Miss Ainsley & the Circus! Now you tell me – is this not the cutest, most original thing you’ve ever seen?! Okay, maybe not THE cutest, as that award probably has to go to little Miss Ainsley herself. Look at this sweet picture her mama sent me so that I would know the special baby I was creating cookies for! When the time came to make & decorate the cookies, Amy had modified her color choices to include “light pink” as well. I incorporated her three colors as much as possible, also including a bit of white here & there for distinction. She also wanted a few special lions & elephants, and I suggested some popcorn boxes to round out the collection. But, of course, there are circus TENTS! 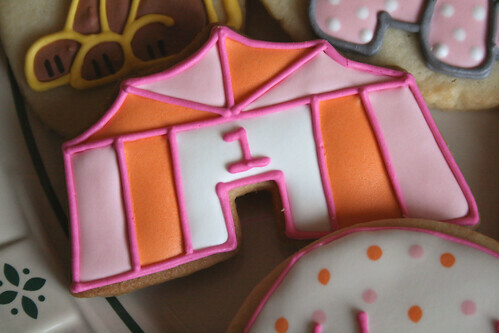 My little tent cookie cutter is quite small, so a tiny ’1′ was the perfect embellishment. I also think the addition of white really helped to pull the colors together. And then there’s the popcorn buckets! I love these larger cookies, and I’m very happy with how they turned out. A simple Wilton #7 tip helped to make all the little “kernels” with ease, too. And then there were the animals – the adorable little lion and cute little elephant! 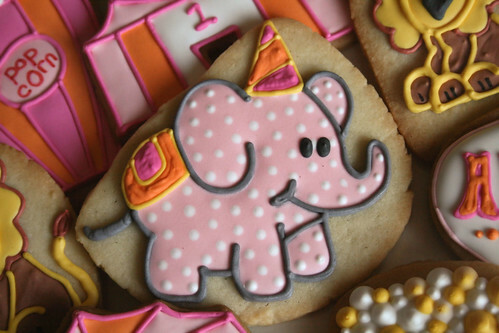 I just couldn’t get enough of these cookies, though the elephant is my very fave! I found the two animal designs above over at Lil’ Sugarpie on embroidered items. They were so perfect I had to recreate them in icing! I hand-cut these cookies, and it wasn’t until after I had done so that I realized… hey, I already had TWO elephant and TWO lion cookie cutters in my stash! Whoops! Originally, Amy wanted oval cookies that said “Circus” on them. 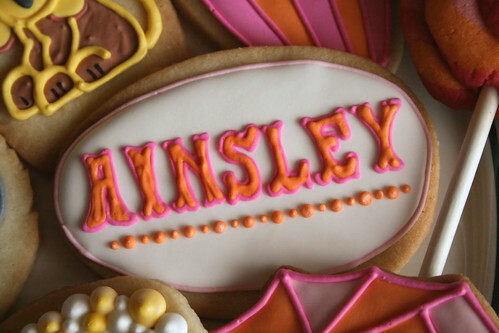 In the end, she switched to having “Ainsley,” but done in a circus-y font. I tried my best to mimic the traditional font, and a KopyKake sure would’ve been a nice help at this point, but I worked with what I had! 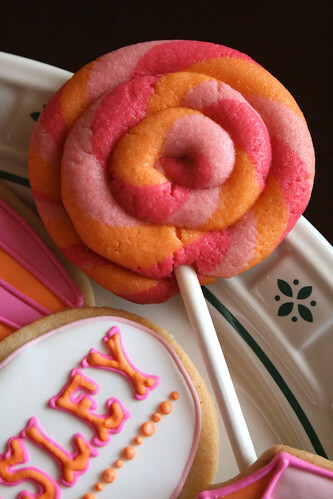 Lastly, Amy chose a couple handful of swirly lollipop cookies for a whimsical touch. She wanted them in her three main colors, and I think they turned out so nice. This was only my second batch ever of lollipop cookies (I made the first set for the 4th of July! ), but they are the absolute easiest cookies to create – especially using the awesome tutorial posted by Occasional Cookies! And, as always, I included a special Thank-You cookie just for Amy, for her to enjoy before she serves the rest at little Ainsley’s party this weekend. I absolutely LOVED working with her, and I hope that the cookies are a big hit at the party! I love when customers have such GREAT original ideas! I love that you can bring your customer’s original ideas to such stunning life. 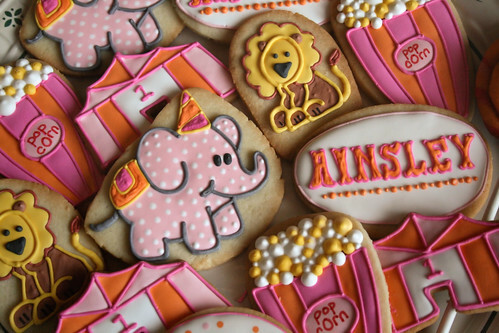 This is one of the cutest birthday assortment of decorated cookies I’ve seen. 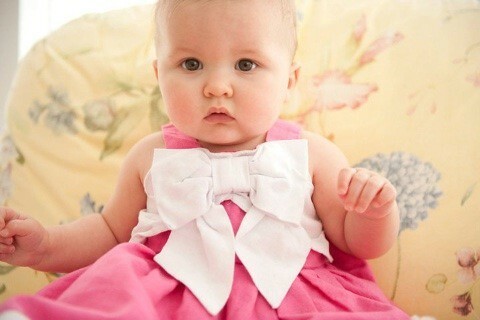 The pudgy little elephant is my favourite too but everything is adorable and little Miss Ainsley is just too precious. What a beauty. Thank you, Paula! It really was just so much fun to work these cookies up. I’d never have thought of such a cute theme on my own, and using her colors really made the different designs POP! are you kidding me right now? these are the cutest cookies i’ve ever seen. LOVE them!!! Thank you so much! I really fell in love with them, too! These were a HUGE hit at the party today! Thank you so much! Awesome, Amy! I’m so very glad! Did you notice Paula’s sweet words on your beautiful Ainsley up above, too?! 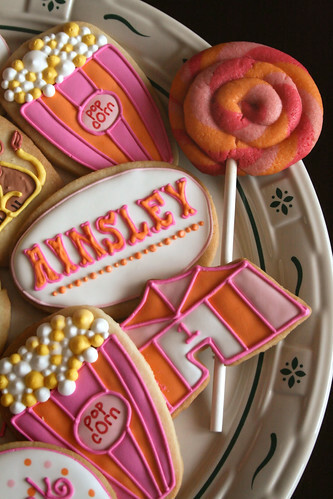 Indeed, I was a guest at Miss Ainsley’s party, and the cookies were a huge hit and looked adorable! Amy always has original ideas! The party was wonderful and the cookies added a touch of class and originality along with whimsy. Aww, Allison – thank you so much! It was so sweet of you to come over & give compliments. I’m thankful you all enjoyed the cookies! Looks great. Good job on the lollipop cookies! I don’t have a kk either, it makes things more challenging at times. Maybe someday……. these are absolutely ADORABLE!!!! GREAT job!! Thanks so much for linking up to my party! I featured your post in my wrap up http://tidymom.net/2011/great-ideas-8/ Have a great holiday weekend. These are adorable beyond belief!!! Hi Krista! I’m so glad you’ve stopped by! I’d never heard of a “girly circus” before, but I absolutely LOVE how things turned out. 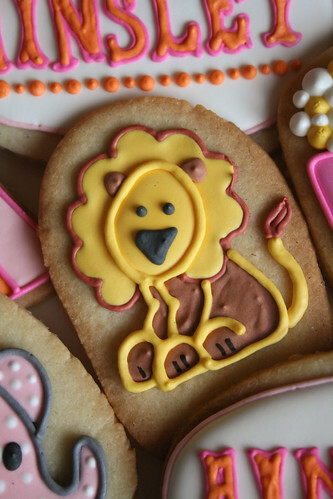 It’s so fun doing a new, creative set of cookies, don’t you think?! 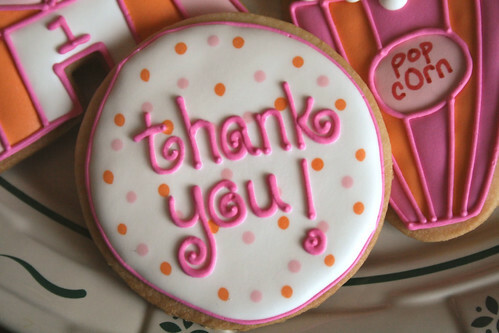 And I *DO* include a special Thank-You cookie for each order. Most times, it’s a simple 3″ round with just the message, but occasionally, I’ll make birthday cakes or cookie bites to spell out a message, too. It all just depends on the order, the customer, and how I feel at the time. I do forget to photograph them OFTEN, though – it always makes me sad when I am editing later & realize it’s too late ‘cuz the cookies are already in the mail! 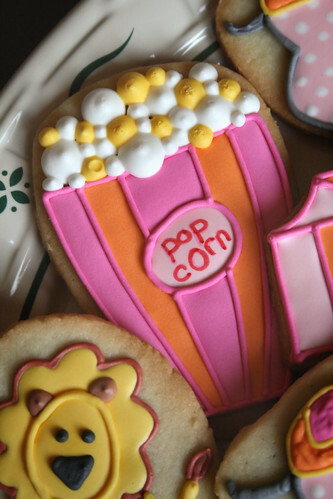 Love this set of cookies. And I’m so thankful you shared them on CookieCrazie’s 4th Birthday Party. The elephants are so adorable!! Great job! Hi I was wondering if you used a cookie cutter for the tent? Im doing a circus theme as well. But it’s for Sat! !